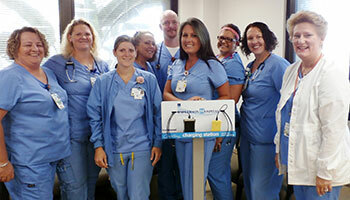 Okeechobee, Florida - Some of Raulerson Hospital's Emergency Department staff members demonstrate the ER Lobby's new cell phone charging station. Often patients and their loved ones experiencing an emergency have no notice and must react quickly. During these times, communication is key. For their convenience Raulerson Hospital's Emergency Department now offers a courtesy cell phone charging station.